Pub in Brixton, part of a small chain. The ground floor is a spare-looking room with high stools clustered around round tables. Another room on the first floor has lower stools plus padded leather armchairs and a sofa. The overall look is a rather strange combination of industrial (tables with brushed metal tops on bases made from large tripod clamps, stools made from bicycle parts) and twee (puce-painted walls). 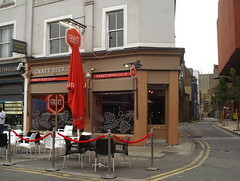 There's also a reasonable-sized seating area outside on the pavement. There are ten handpumps for real ale, and twenty keg taps, as well as a large choice of bottles. When Kake visited on a Thursday afternoon in September 2014, I was the first customer of the day, arriving just as they opened at 4:30pm. When I left half an hour later, there was one other. Music was playing, relatively interesting rock, louder than would have been ideal for conversation if there had been more people in, but fine when the place was empty. On bob's Wednesday evening visit in January 2016 there was plenty of free seating upstairs and it wasn't too noisy up there. In September 2014, all ten handpumps were clipped for interesting-looking beers. The staff member on duty was happy to give advice on what to choose, but didn't offer tasters. A half of Moncada Notting Hill Porter was £2. When secretlondon visited in August and September 2015, they were certainly doing tasters. On bob's January 2016 visit the beer was fine, with the Maple Wheat IPA standing out; it had a really strong maple flavour. Food is limited to pies and scotch eggs; the scotch egg options include a vegetarian one and a black pudding one. On our early evening visit in September 2014 the scotch eggs hadn't been delivered yet. Accessibility: A small step to get in. All the interior seating on the ground floor is on high stools — the only normal-height seating is either outside or on the first floor. The toilets are halfway up the staircase to the first floor, although there is another toilet on the ground floor which is nominally ladies but is also used by mobility impaired men. Last visited by bob, January 2016. Opening hours taken from the 2015 Good Beer Guide. Last edited 2017-09-06 12:39:52 (version 11; diff). List all versions. Page last edited 2017-09-06 12:39:52 (version 11).